On Saturday Sept 17thÂ the SAA will be doing the almost-end-of -season ride around Birch Bay park then out to the Dutch Bakery in Lynden. 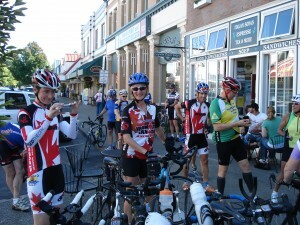 This is a casual group ride, done at an easy pace, so everyone is welcome to join in. Since this ride travels into the United States, your TriBC insurance is not valid, so please arrange for any individual travel insurance you wish to have. Also ensure you have proper travel documents to cross the border (i.e. passport, nexus, etc). The exact starting point near the Peace Arch crossing is yet to be determined. It may be the Pink Palace hotel, or Peace ArchÂ Park.Â Watch here for details. Start time will be 8:30am.